Moet & Chandon exudes luxury; it owns the Dom Perignon brand, Moet Hennessy, Louis Vuitton and even supplies champagne to Queen Elizabeth II. The Champagne house was established in 1743 by Claude Moet and is credited with first producing vintage Champagne in 1840. Today it is the world’s largest Champagne house, producing over 26,000,000 bottles per year! 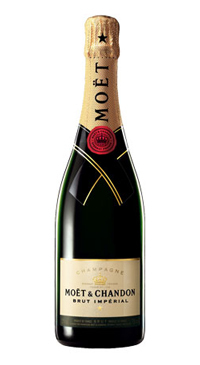 The Brut Imperial is Moet’s best selling Champagne. Aromas of apple, pear, citrus and fresh baked bread. The palate if fruity with a medium body and similar flavours as the nose with some mineral coming through on the finish. Well-balanced, exhibiting flavors of light toast, Gala apple, honey and ginger, with smoke and mineral notes underscoring hints of tropical pineapple and tangerine fruit. There’s lovely texture, with a firm backbone of juicy acidity.